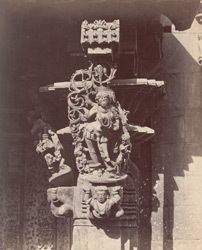 Photograph of a sculpture from the Mallikarjuna Temple at Kuruvatti, taken by Henry Cousens in the 1880s. Kuruvatti is located in the modern state of Karnataka. This large temple was built in the late Chalukya style towards the end of the 10th century. It faces east and consists of a sanctuary with a closed hall with three entrances. The columns throughout the temple are beautifully carved, those on the outside are thin and elegant whilst those on the inside are lathe turned and are finely carved. The sculptured wall-panels that decorate the exterior are very finely executed. The central entrance into the hall is famous for its bracket figures. They are carved in soapstone with extraordinary details and are situated on the side of the door frame. They represent female figures wearing elaborate ornaments, with scrolls motifs behind them and with ghanas or dwarf attendants supporting their pedestal.